Easter in Bermuda, as in many places, is celebrated with church services, egg hunts, and festive meals. But what makes Bermuda’s Easter observation unique is the tradition of kite flying on Good Friday. In a report for the island’s schools compiled by the Department of Community & Cultural Affairs, it’s noted how most Bermuda families choose to pass the day together setting aloft brightly coloured kites. The sky is transformed into a dancing mosaic of brilliant and beautiful shapes, colours, and sounds. The business of kite flying is only interrupted by the temptation of codfish cakes and warm hot cross buns. Those who make kites spend months preparing for this holiday. No one is certain how this long-established Bermuda tradition started, but one story often repeated is that it began with a Sunday school teacher’s creative lesson on Jesus Christ’s ascension to heaven. It is said that the teacher made a cross kite, took it to a hilltop, and set it flying, then cut the string and the students watched it sail upward towards heaven. However the tradition started, kite flying on Good Friday is now an avidly awaited ritual in Bermuda. Al Seymour Jr, of Somerset, who has been making kites since he was 11 years old, recalls how as a youngster he thought of Good Friday as a joyful day of kite flying: “Good Friday was like Christmas morning. It was like having Christmas twice. “A lot of people my age and older would get up at 6.00 am and go outside to see whose kite was up first and making the most noise. Kites would be up all day. We made them and flew them. 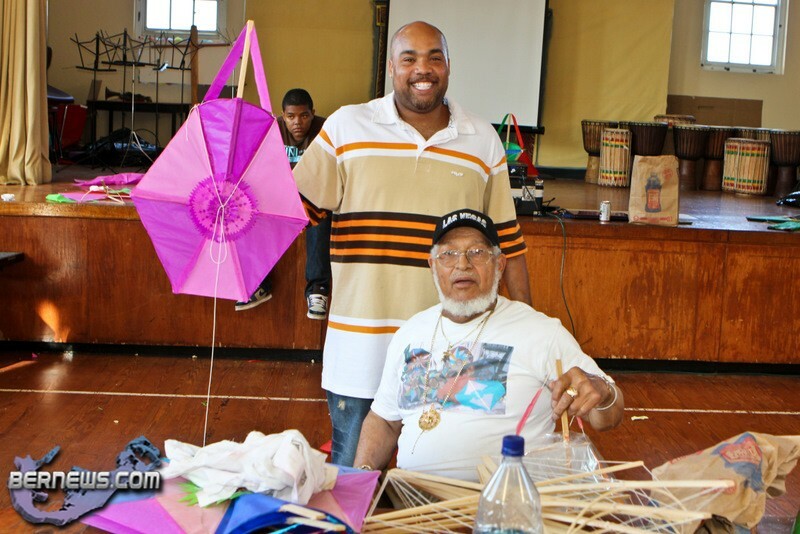 Bermudian kites are carefully crafted from colourful tissue paper and clear white pine wood, with rattan or cane (bamboo) for the headstick bender. Great care is taken to ensure that the colours blend perfectly. Originally kites were made out of newspapers, brown paper, a page from a notebook, fennel sticks, and flour mixed with a little water served as the glue. 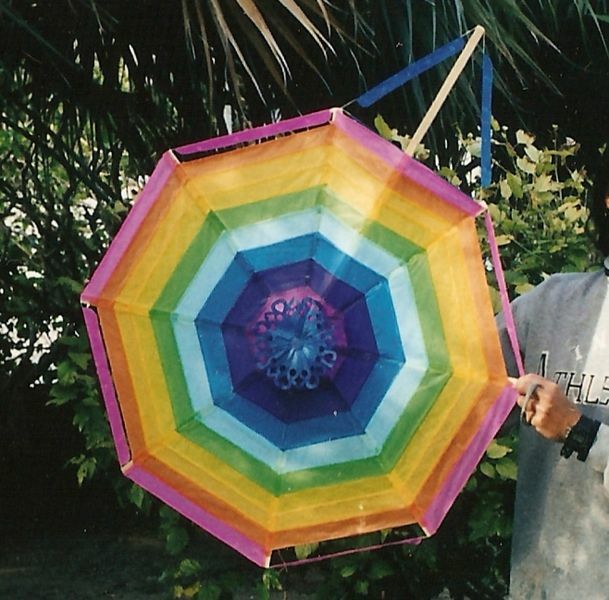 In the past many Bermudians made their own kites. Unfortunately today’s busy lifestyle leaves little time for kite making. While some folks still make or purchase traditional kites of paper, imported plastic kites are becoming popular because of their convenience and lower price. Each Bermudian kite is unique with different shapes and colours creating its style. Mr Seymour stated that the Bermuda headstick kite is the best known design. He says, “Its four-stick design goes back to the 1800s. The kite is admired in the kite world because it is both sturdy in framework and delicate in its covering and patterns. Rather than for their shapes and colours, Somerset kites are famous for the sound caused by their hummers. Kite maker Antoine [Sow Wow] Simons, of Somerset, explains why Somerset kites, called buzzards, are considered the loudest and wildest of all Bermuda kites. He said: “It’s more or less built for sound. They do have some colours in the lines, but the main object of that kite is for the flying technique and the sound. It makes an extra loud sound. “What gives it its sound is the tightness of the hummer line. The tighter the line, the more noise the kite will make. And the structure of the kite balances out along with the lines and the amount of breeze that’s blowing that particular day. If you wanted to make a kite to fly today, you would more or less build a kite according to the wind today. If you have some already made, you would know which one to fly today because of how much wind is blowing. This is why most kites in Somerset are made with wire rather than bamboo, because the bamboo would bend up when you tighten the hummer line unless you reconstruct the kite with some type of reinforcement behind it to keep the bamboo from bending. “We usually use the bamboo only if we’re going in a kite competition. For the prettiest kite and stuff,” said Mr. Simons. “But when it comes to flying the kite, we never use them because we are looking for the sound. “Sometimes I’ll have one particular kite in one year that makes [such an] outstanding sound that it will never lose me. I’ll have that kite in my memory for a very long time. “Out of all those kites, there’s one sound that will really stand out amongst the rest, and [it] will stay with you for a very long time until you can make another kite that will end up having a very loud sound as well. How exactly is a hummer made? Mr. Seymour explains: “String is strung along the back and up on both sides of the headstick to form a triangle. Tissue paper is cut, folded in half and glued on the string. This combination creates a sound when both vibrate in the wind. Excellent, informative and a fun read. Thank you! Thank you so much for this wonderful piece. Actually, the link between kites and Easter is not exactly unique to Bermuda. We have the same tradition in Guyana. Most of what you said about the uniqueness of each kite, the pride that goes into each one, etc. most certainly applies to Guyana. Some boys (of all ages) spend months preparing and perfecting their kites for Easter. The big difference is that the big kite-flying day is Easter Monday–the Monday after Holy Friday, which is a big public holiday. I was raised in a Catholic family and we would never dream of flying kites on Holy Friday, which was a day of long and somber church services that reflected upon Jesus’ awful death. From noon til 3 pm we were hardly allowed to speak, let along fly a kite. For us Catholics, flying kites on Monday was vaguely connected to the notion that by then Jesus would have arisen from the death and readying for Ascension to heaven. But the tradition was never limited to Christians alone. Christians, Hindus, Muslims all join in until you can hardly see the sky for the kites. It is Christmas for everybody–a rare time for folks to at least temporarily ignore their silly differences. I have been trying for years to figure out where the tradition began. It is fascinating to find it in distant Bermuda. Perhaps it is somehow linked to our common British colonizers? But I have not found evidence of the practice there. A most informative and pleasant read. I will pass this on to my grandchildren.